The Valley of Roses is irrigated by the Asif M’Goun river. The river begins in the M’Goun mountain range nearby, whose summit is the Ighil M’Goun mountain, standing at 4,071 m. Its inhabitants practice subsistence farming here on small plots of land, primarily growing wheat, alfalfa for livestock and fruit trees. Birch trees are also planted for use as timber. 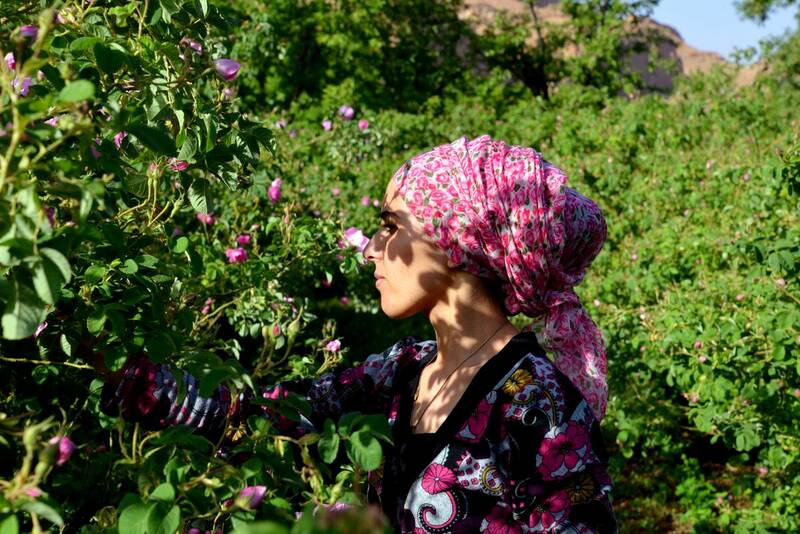 These plots are all surrounded by rows of wild Damask rose trees from the Rosa damascena botanical species, which offers excellent protection against ruminants that may damage them. Multiple irrigation channels supply these plots of land. Roses are a very important crop booster to the local population. 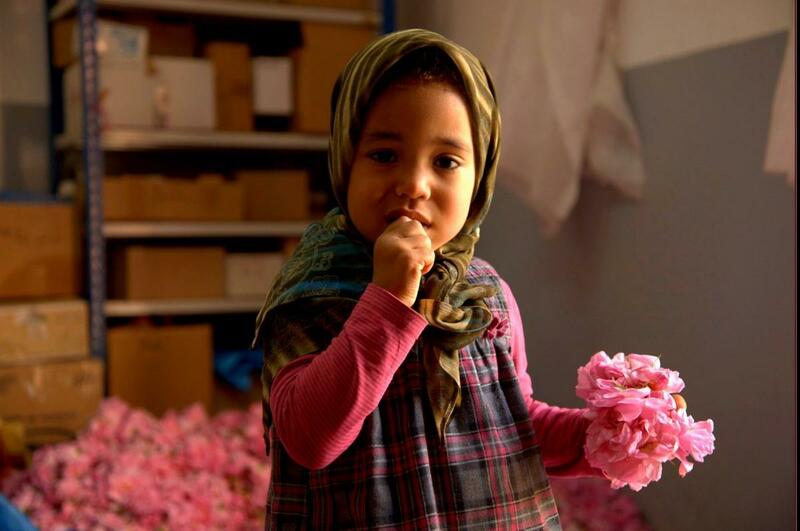 They also offer a major source of income during the rose season, which begins around 10 April and ends around 20 May, depending on climate conditions. Every morning before sunrise, pickers set about harvesting the first rosebuds and rose blooms and placing them into a cotton or jute bag. 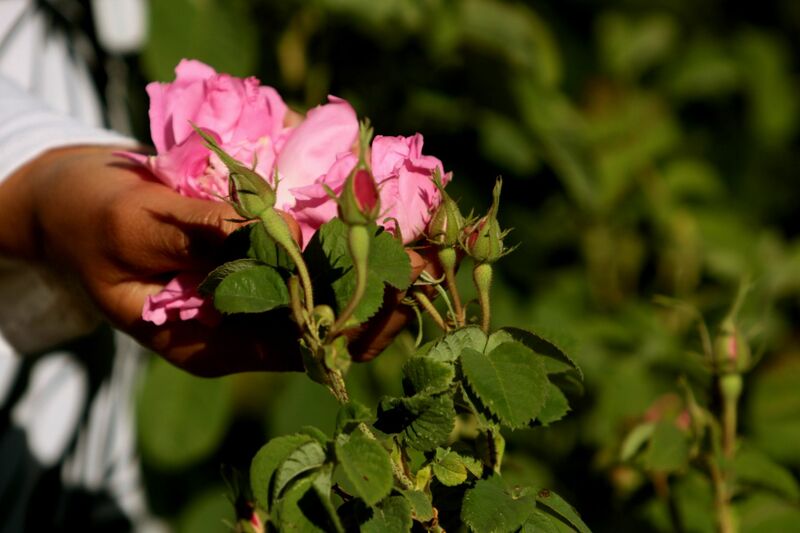 It is important to pick them early in the morning or late afternoon, as the sun diminishes the olfactory quality of the roses. The crop is then taken to the Kasbahs for initial sorting. 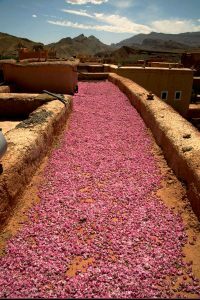 After sorting, the rosebuds are dried on the terracotta-coloured roofs for 2 days, then continue drying in well-ventilated rooms for a further month. The very dry mountain climate provides good drying conditions, whereas humidity would cause the roses to rot. Once dried, the roses are used to make scented potpourri. Immediate distillation produces authentic rose hydrolat, also called ‘floral water’ or ‘rose water’, which is used locally for ablutions or for flavouring in pastries. 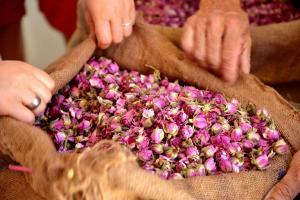 Damask rose is also extracted for the premium perfume industry and for essential oil. The unrivalled properties of this rose essence care for the body as well as the mind; it is a true beauty queen. The sight of pickers gathering roses at dawn like bees under the orchard canopy, accompanied by the soothing sound of flowing water, is a delightful scene. 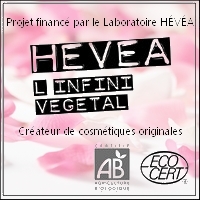 Find all the products of the Kasbah des Roses and the complete range of the Laboratory Hevea on our online shop. KASBAH DES ROSES is not a travel agency, and cannot reply to emails concerning tourist activities, accommodation bookings and similar questions.